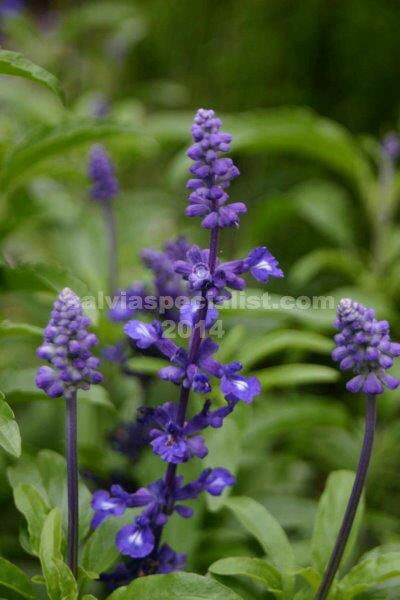 Farinacea is the species name of the plants often sold in Australia as blue salvia. They are used widely and have been bred a lot so there are shorter and longer and white as well as blue. They are marvellous plants for staying in shape and blooming all year and very handy for using in shade. Generally they are only good for two years though I have not tried cutting it down after two years. It doesn’t seem to have a lot of strength after two years. Farinacea is one of the parents of ‘Indigo Spires’ and also ‘Mystic Spires’. 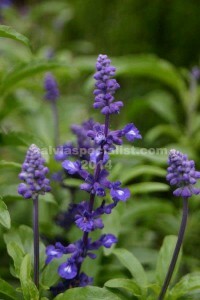 ‘Indigo Spires’ is a very permanent excellent plant. It is rather robust and can get tall if not pruned back at all. ‘Mystic Spires’ is a more compact version of ‘Indigo Spires’.